Description: In satin chrome with shiny chrome accent, Twist action mechanism, Supplied with black ink. Features: Engraves silver. Packaging: Polybag. Colour: Silver. Material: Metal. Product Size: 137mm(h) x 11mm(w) x 12mm(diam). Decoration: Pad Print, Engrave. Decoration Area: Pad/Laser: 35mm(h) x 6mm(w). Description: Matt silver finish with shiny silver accents. Features: Supplied with black ink. Engraves: Shiny Silver. Packaging: Polybag. Colour: Silver. Material: metal/Matt silver finish. Product Size: 136mm(h) x 13mm(diam). Decoration: Pad Print, Engrave. Decoration Area: Laser: 40mm(w) x 7mm(h), Pad: 40mm(w) x 9mm(h). Description: Silver carbon fibre ballpoint pen with matt silver finish. Features: Supplied with Black ink. Engraves: Silver. Packaging: Polybag. Colour: Silver. Material: Metal pen with woven patterned fabric captured under the glass shiny silver accents. Product Size: 140mm(h) x 12mm(diam). Decoration: Pad Print, Engrave. Decoration Area: Laser/Pad: 40mm(w) x 8mm(h). Description: Metal twist action ball pen in black with silver carbon fibre band and shiny silver accents. Features: Supplied with Black ink. Engraves: Silver. Packaging: Polybag. Colour: Black. Material: Metal. Product Size: 137mm(h) x 12mm(diam). Decoration: Pad Print, Engrave. Decoration Area: Laser/Pad: 25mm(w) x 7mm(h). Description: Metal twist action ball pen in silver with silver carbon fibre band and shiny silver accents. Features: Supplied with Black ink. Engraves: Silver. Packaging: Polybag. Colour: Silver. Material: Metal. Product Size: 137mm(h) x 12mm(diam). Decoration: Pad Print, Engrave. Decoration Area: Laser/Pad: 25mm(w) x 7mm(h). Description: Metal Ballpoint pen with matt silver finish with shiny silver accents. Features: Supplied with Black ink. Engraves: Shiny Silver. Packaging: Polybag. Colour: Silver. Material: Matt Silver finish with shiny silver accents. Product Size: 138mm(h) x 15mm(diam). Decoration: Pad Print, Engrave. Decoration Area: Laser: 40mm(w) x 7mm(h), Pad: 40mm(w) x 9mm(h). Description: Matt Silver finish with shiny silver accents. Features: Supplied with Black ink. Engraves: Shiny Silver. Packaging: Polybag. Colour: Silver. Material: Matt Silver finish with shiny silver accents. Product Size: 140mm(h) x 15mm(diam). Decoration: Pad Print, Engrave. Decoration Area: Laser: 40mm(w) x 7mm(h), Pad: 40mm(w) x 9mm(h). Description: Metal Ballpoint pen with matt silver finish. Features: Shiny silver and black gloss accents, Supplied with Black ink. Engraves: champagne. Packaging: Polybag. Colour: Silver. Material: Matt silver finish with shiny silver and black gloss accents. Product Size: 140mm(h) x 12mm(diam). Decoration: Pad Print, Engrave. Decoration Area: Laser/Pad: 38mm(w) x 7mm(h). 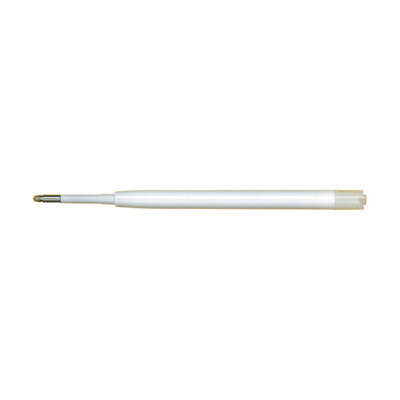 Description: Metal Ballpoint pen. Features: Black gloss finish with shiny silver accents, Supplied with Black ink. Engraves: Silver. Packaging: Polybag. Colour: Black. Material: Black gloss finish with shiny silver accents. Product Size: 140mm(h) x 12mm(diam). Decoration: Pad Print, Engrave. Decoration Area: Laser/Pad: 38mm(w) x 7mm(h). Description: A stunning pencil designed with a difference. Features: Matt silver finish with diamond pattern and black accents, Hinged clip for ease of use. Engraves: Champagne. Packaging: Polybag. Colour: Silver. Material: Matt silver finish with black accents. Product Size: 145mm(h) x 13mm(diam). Decoration: Pad Print, Engrave. Decoration Area: Laser: 40mm(w) x 6mm(h), Pad: 40mm(w) x 7mm(h). 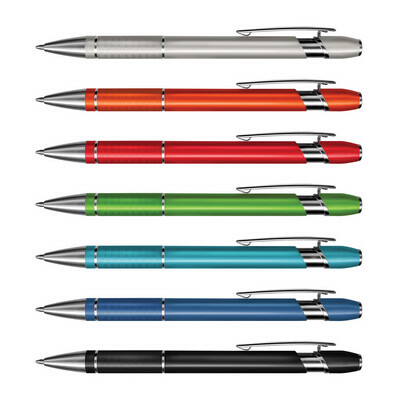 Description: This popular ballpoint carbon fibre pen has a delightful woven patterned fabric captured under the glass. Features: Supplied with Black ink. Engraves: Silver. Packaging: Polybag. Colour: Black and Matt Silver finish. Material: Lid: Matt silver with shiny nickel clip, Body: woven patterned fabric captured under the glass. Product Size: 145mm x 13mm . Decoration: Pad Print, Engrave. Decoration Area: Laser/Pad: 40mm(w) x 8mm(h). Description: Twist action mechanism. 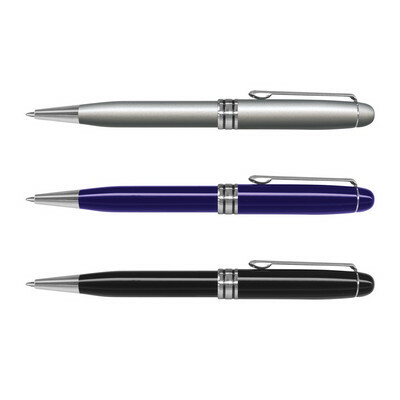 Features: A great unisex pen, with a feature silver band it is very stylish, Supplied with black ink, Available in 2 colours. Engraves: Silver. Packaging: Polybag. Colour: Black. Material: Metal. Decoration: Pad / Engrave. Decoration Area: Pad/Laser: 38mm(h) x 6mm(w). Description: Twist action brass barrel. Features: Coated with a flat rubberised material then offset with a flat chrome clip, Supplied with blue ink. Engraves: Silver. Packaging: Polybag. Colour: Silver. Material: Brass/coated with a flat rubberised material. Product Size: 145mm(h) x 13mm. Decoration: Pad Print, Engrave. Decoration Area: Laser/Pad: 40mm(w) x 7mm(h). Description: Twist action ballpoint pen. Features: Supplied with Blue ink. Available in 2 colours. Engraves: Silver. Packaging: Polybag. Colour: Black. Product Size: 140mm(h) x 15mm. Material: Black gloss finish and shiny chrome trim. Decoration: Pad Print, Engrave. Decoration Area: Laser/Pad: 35mm(w) x 7mm(h). Description: A unique sculptured silhouette look with a clever pocket-saver mechanism that prevents ink stains. 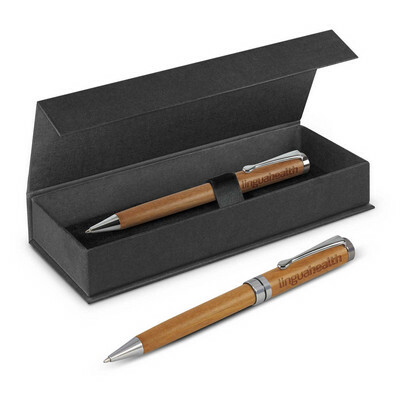 Features: Sculptura pen with a nickel silver clip comes in a handsome case with a soft pouch, Supplied with Black ink. Engraves: Silver. Packaging: 2 part black gift box 185mm x 65mm x 25mm moulded inlay Polybag tissue wrap and black velvet pouch-pad print foil stamp. Packaging Size: 180mm(h) x 60mm(w) x 28mm(d). Colour: Nickel Silver. Product Size: 145mm(h) x 13mm. Decoration: Pad / Engrave. Decoration Area: Laser/Pad - On Barrel: 30mm(w) x 7mm(h), Under Clip: 30mm(w) x 4mm(h). Description: Exclusive Luxe design. Features: Double layered lacquer detail accenting subtle pinstripes on lower barrel, Shiny chrome upper barrel and color fill clip accents complete design, Pen includes premium black ink cartridge. Packaging: Presented in a black tuck box and presented in a foam polybag. Packaging 165mm(h) x 35mm(w) x 30mm(d). Colour: Black. Material: Brass. Product Size: 138mm(h) x 10mm(w). Decoration: Pad Print, Engrave. Decoration Area: Pad/Laser: 38mm(w) x 6mm(h). Description: Exclusive Luxe design. Features: Double layered lacquer detail accenting subtle pinstripes on lower barrel, Shiny chrome upper barrel and color fill clip accents complete design, Pen includes premium black ink cartridge. Packaging: Presented in a black tuck box and presented in a foam polybag. Packaging 165mm(h) x 35mm(w) x 30mm(d). Colour: Silver. Material: Brass. Product Size: 138mm(h) x 10mm(w). Decoration: Pad Print, Engrave. Decoration Area: Pad/Laser: 38mm(w) x 6mm(h).